I decided to try a methodical coffee storage experiment. I'm using 5 different kinds of storage containers (plus one extra as a control), each with 33 grams (the exact amount I use each day to make coffee for Kivi and myself) of VERY fresh coffee, that was roasted yesterday (I wanted coffee roasted today, but I'll do that in the next iteration of this experiment). See the code on the sticker? Here's what I did: I got 4 each of 5 different kinds of storage, and packed the coffee in 33-gram increments in each. I'll open the first batch after one week, two weeks, three weeks, and four weeks, to see how well they keep the coffee fresh over time. I got the ones with a metal lid. There is no rubber seal, so hopefully they are airtight. Container 3: 4.25 oz/125 ml Fido bale-top canning jar with a rubber seal. These held 33 grams of coffee easily, with more headspace than I'd like. Fidos are well-liked in the home-fermenting world, because they allow CO2 to escape when pressure builds high enough, without letting any air back in (i.e. if air was allowed back in, mold would grow on the surface of the ferment, and that rarely happens with the Fidos). http://www.amazon.com/125-Terrine-Hermetic-Canning-Storage/dp/B00DH08GRE (we got a better price than what is shown here - shop around). 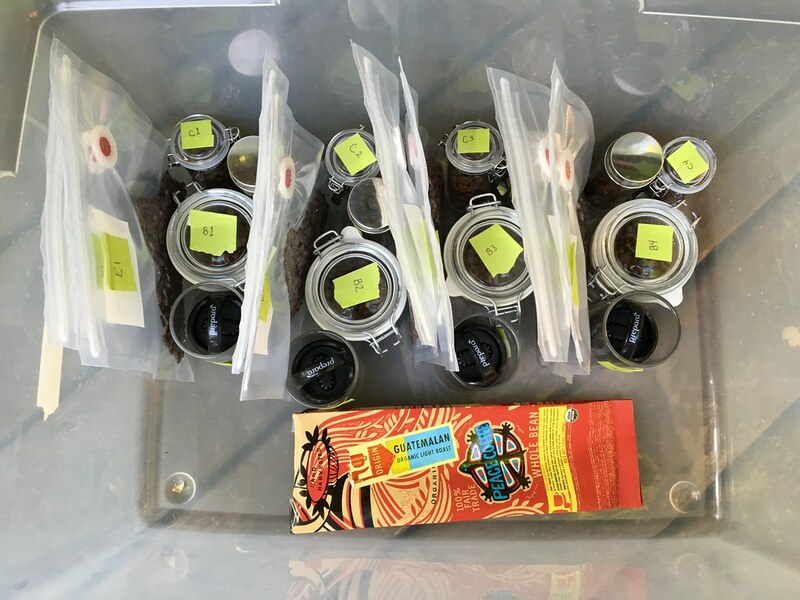 My intent is to do a cupping each week, to see how the beans survived the storage methods over time. 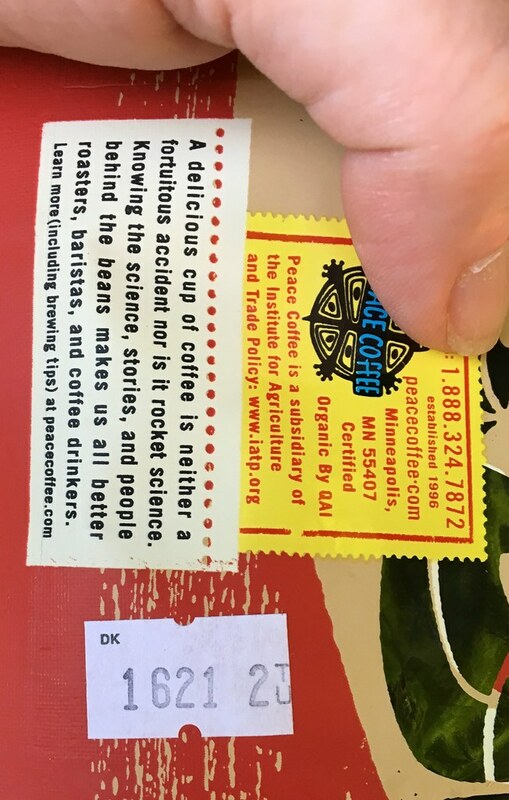 My daughter will mix the samples (assign a code to each), so that when I evaluate the taste of the coffee made from the beans, I will not know which sample is which. I'll take notes on my findings, but will not look at the results until all four weeks are complete. I intend to repeat the experiment every month for 4-5 months, using the same coffee each time. Each month I will vary the time past roasting. This month, the coffee is roast+1 (i.e, I packed the samples one day after roasting). Hopefully next month I'll test roast+0. This should measure the effect of the CO2 outgassing (40% of the CO2 is lost in the first 24 hours) on storage. Eventually, I intend to attempt (somehow) to add CO2 to the beans if they are older, to prevent the beans from being packed with any O2. But, we'll see. The coffee came from Peace Coffee, a fairly large Twin Cities roaster. They are big enough that I'll be able to get this same coffee month after month (though they cannot guarantee that it will come from the same batch of green beans, but I can't control for everything), but small enough that they have the flexibility to work with someone like me who only wants 2 pounds of coffee, and think my geekiness is totally cool. Only drawback is that their roastery is only open 8am-4pm Monday-Friday (in other words, during working hours, 50 minutes from my home). 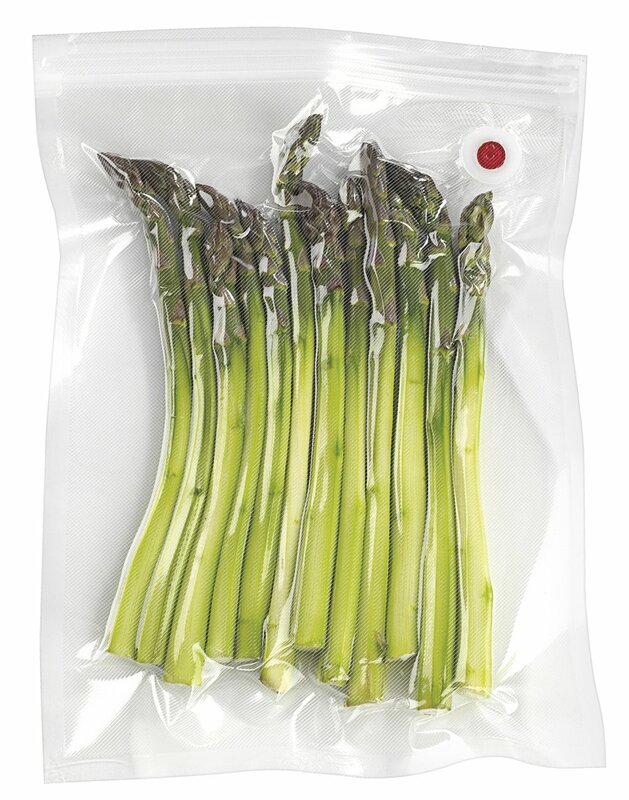 Update: The next morning, I got more bags, and vacuum-packed four more samples, and froze them. In the past, I'd decided that freezing beans made them taste funny, but due to recommendations from someone online, I decided to throw freezing into the mix.